"What this is is no mystery - it is one of Hardwicke's handrail knobs. The mystery, at least for me, is how is it fixed to the pipe? This modern one is probably welded on but how did they do it in 1892?" It seems to me that the handrail is not attached to the knob at all but simply passes through it. I think Philip may be mistaken. Roger asks how the handrail knob is attached to the 'pipe' - the pipe being the ejector exhaust pipe which runs along the left side of the boiler, and to which the handrail is attached - the 'handrail' passing through the 'handrail knob'. Without intimate knowledge of this fitting on Hardwicke I would surmise that the knob is screwed into the ejector exhaust pipe. 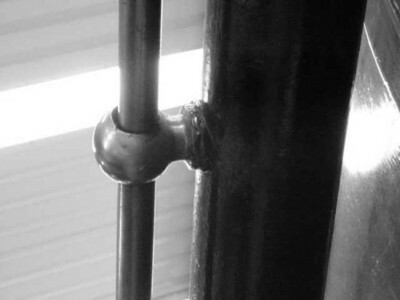 If so this would take some good engineering to ensure each knob lined-up and also provided an air-tight seal (whitemetal or copper washer to suit the radius of the pipe perhaps?). However, although electric arc welding was in its infancy around the period these engines were constructed, it was making progress as a viable process, so perhaps Crewe were continuing their tradition of seeking and trying new methods of production. It is an interesting topic, of which perhaps others may have knowledge.